In the third year of the World House project, the Institute partnered with Habitat for Humanity Canada and Evergreen to take on the issue of suburban revitalization at the neighbourhood scale. The IwB explored ways to address the issues of the decay of Toronto’s inner suburbs and looked at ways to create more balanced and sustainable suburban neighbourhoods by co-creating and engaging with neighbourhood groups using social innovation practices. The main outcome of the project was Renovate Your Neighbourhood, a catalogue of do-it-yourself urban renewal tactics that empower citizens to implement simple and then increasingly complex projects within their constituencies. Your city needs you! Re:novate the house, re:purpose the mall, re:juvenate the school, or re:vitalize the park! To look at ways to revitalize Toronto’s aging suburbs and create more balanced 21st Century sustainable suburban communities. To create a toolkit that helps citizens revitalize their communities and partner with established not-for-profit groups like Evergreen and Habitat for Humanity to realize social innovation and citizen-led change. Proposed product line as part of the Renovate Your Neighbourhood proposal for Evergreen Brick Works. 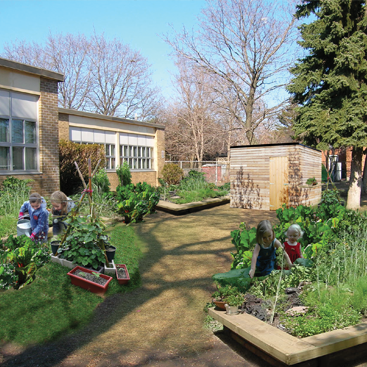 Proposed intervention to animate a school's exterior with a food garden and after school programming. Year end show at the School of Design's gallery. Neighbourhoods are the building blocks of a city, distinct in their individual characteristics, yet linked through municipal policies, systems, and services. Neighbourhoods are also a collective responsibility—one that is shared between the municipality, corporations, institutions, nonprofit agencies and residents. By working together, the City of Toronto, private and public organizations and companies, and citizens have an opportunity to impact a significant portion of the city by looking beyond the downtown core to the residential areas of the inner suburbs. In year three of the World House project, the Institute partnered with Habitat for Humanity Canada and Evergreen, taking on a suburban revitalization project in the Don Mills area of Toronto. This area became the project case study after site analysis showed Broadlands Boulevard as a suburb in need of updating and renovation. The IwB explored how to renovate Toronto’s aging inner suburbs through citizen engagement, by making small scale interventions that respond to challenges facing the community. These challenges included the cost of housing, climate change, rising community apathy, and access to resources like food, energy, and services. 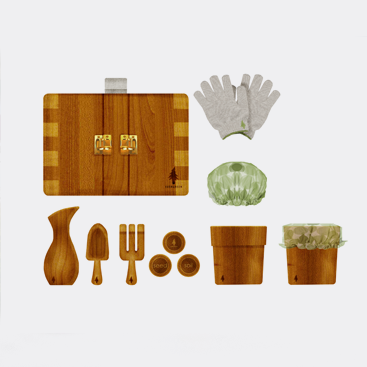 The IwB produced Renovate Your Neighbourhood, a catalogue and a toolkit that helps citizens revitalize their communities and partner with established not-for-profit groups like Evergreen and Habitat for Humanity. The catalogue is a step-by-step guide of how to assess and respond to the issues facing suburban neighbourhoods and execute projects at different scales. Renovate Your Neighbourhood is based on an understanding of the fundamental components of suburban neighbourhoods and how typological interventions could help them become more balanced. Twelve project samples that scale from small to large are provided for individual and community initiatives. Using the catalogue’s community checklist, participants can evaluate and determine the neighbourhood’s strengths and weaknesses. The catalogue provides four areas for intervention: re:novate the house, re:purpose the mall, re:juvenate the school, and re:vitalize the park. Each project is addressed at 3 scales: small, medium, and large. The 12 neighbourhood improvement projects proposed solutions to contemporary challenges in the inner suburbs. By activating public spaces, revitalizing and creating green urban spaces, diversifying and intensifying land uses, increasing employment, reducing car traffic, increasing local access to resources such as food and energy, reducing demands on city systems, and increasing the expression of local identities, these neighbourhoods could become more sustainable and resilient in the next century. Residents have expert knowledge about their neighbourhoods in that they have an intimate knowledge and experience with their neighbourhood. At its core, Renovate Your Neighbourhood is about organizing the community as a critical mass with the capacity, resources, decision making power, and people needed to implement change at small, medium, and large scales. 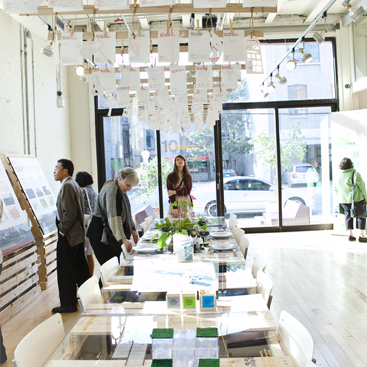 The catalogue provides feasible ideas for neighbourhood revitalization. It shows how to evaluate your neighbourhood’s needs and priorities, and demonstrates how to design and implement your own projects based on them. As well, it promotes thinking about the neighbourhood as an untapped resource, a collective responsibility, an unlimited possibility, and a place for positive action. Throughout the academic year, the students also conducted several other projects and charrettes that dealt with revitalization at the neighbourhood scale. For more information, see the year highlights below. How Do You See the Street? 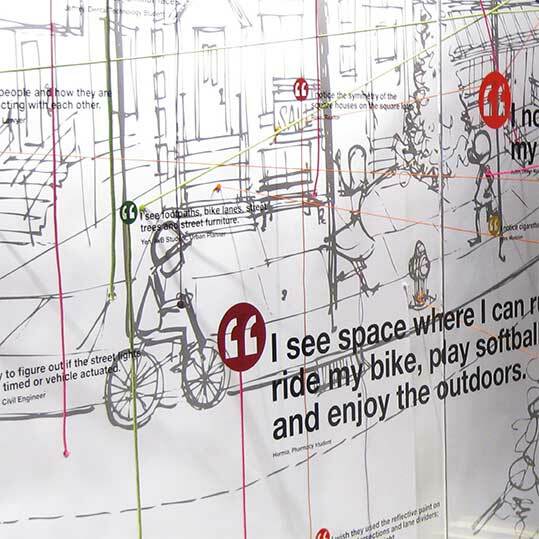 IwB students solicited responses from the public and the design community on their perceptions of public streetscapes to create a display at the School of Design. This display led to the students’ concept for their 2009 Interior Design Booth, which won the Best Student Exhibit Rado DesignGenNext Award. See the IDS: Student Booths project page for more details. For this charrette, the IwB collaborated with the Department of Architectural Technology to propose design options for affordable housing using an existing Habitat for Humanity site, located at 2 Earl Street in Mississauga. The charrette challenge was to propose a design for a housing unit that addresses the living needs of young couples, traditional families, mixed-generational families, alternative families, and/ or elderly couples as well as a design for a multi-unit housing cluster or complex (which could include a variety of housing typologies). The charrette was a great way to develop practical and innovative design approaches and criteria that address the Habitat for Humanity and the IwB’s mandates. In 2008-2009 Evergreen Brickworks was still in its early development. Throughout the year, the IwB students spent time doing research at the site and proposing ideas for development. In November 2008, the students conducted a small charrette called “Evergreen Brick Works Farmers’ Market Charrette,” which looked at expanding the existing Evergreen farmers’ market and proposing new programming ideas for Evergreen as a whole. The students interviewed farmers and community members at the market in order to get a sense of the market’s demographics. The point was to create ideas for future programming at Evergreen, in particular to develop a restaurant and a store. Following the charrette, the students worked on new products design concepts for a possible future store at the site called the Evergreen Brick Works Marche. 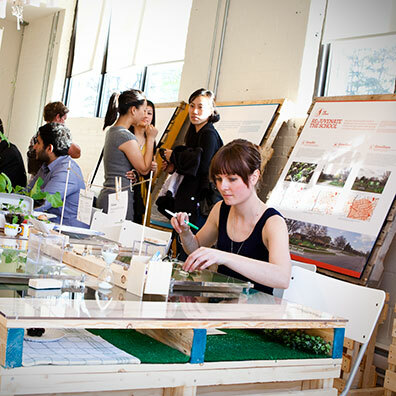 The Urban Living Design Charrette was a three-day initiative hosted by the IwB in collaboration with the George Brown College Department of Architectural Technology. Seven charrette teams investigated design options for Toronto high-rise condominium living, and ultimately produced schematic designs for a model condominium unit. Each team conducted market research on a specific condominium user group–single professionals, young couples, or seniors–and developed a design proposal that seeks to improve user satisfaction and quality of living. The charrette built on the Institute’s World House Project research and was also be grounded in the design mandates of TAS DesignBuild. For their end of year exhibition, the IwB students created an interactive display of projects that dealt with rejuvenating housing, parks, schools and malls and promoting greening, diversity and resident engagement.